We can capture YOUR WORLD from another angle – EVERY Angle in fact! I have teamed up with a good friend of mine to offer a fantastic opportunity to businesses who require some of the most amazing views of their premises and products. This type of photography is striking and impressive to use as promotional photographs or video footage. It has many applications and both internal and external, 360 degree photos and videos can be produced. You can see far more detail and get a real feel for the building or area concerned. A picture may well say a thousand word but when you can move yourself around the picture, backwards and forwards, up and down, you get a true idea of the environment. You can study areas of the environment by zooming in and out inside a FULL 360 DEGREE Photograph. The view is as though you were inside a bubble with the ability to see the world all around you. With amazing 5K Picture Quality your customers cannot fail to be impressed. 360 Degree Videos are sometimes mistaken for Drone Videos. However the system we use is better than a drone for low-level recording and safer too when people and property are nearby. 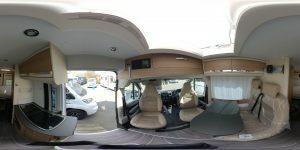 Take a look at the example of a Motorhome below to see how effective our 360 degree photos are. You can pan around the photo below to see every detail. Scrolling the wheel on your mouse allows you to zoom in and out. Fly-through videos filmed in normal, bullet mode, hyper-speed or slow-mo can impress and inform potential visitors by giving a “Better than Lifelike” view of your park or centre. In a few minutes viewers will be eager to come and visit! Perfect if you are selling your house. Potential buyers can get a real insight into how the property feels. Call me, Andy on 07772 481067 to discuss our property video package. It is more affordable than you think!